Litho-acoustic project using desert flints to unearth a hidden order and undiscovered musical scales in the landscape of Jordan and Palestine. 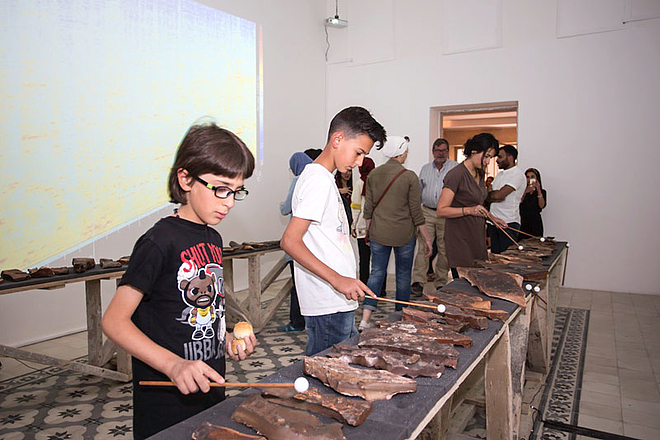 Until 24 September 2017, Amman's contemporary art center Darat al Funun presents the exhibition Desert Soundscapes by architect and artist Ammar Khammash, where he explores the landscape of Jordan and Palestine to unearth a hidden order, a secret code, or an undiscovered musical scale hidden in the millions of flints in the desert. The search for order in nature has been a fundamental interest for Ammar Khammash. As an architect and an artist, he cultivated an eye to see and understand how nature makes form; its way of making composition in material, void, light and sound, and how it generates order. 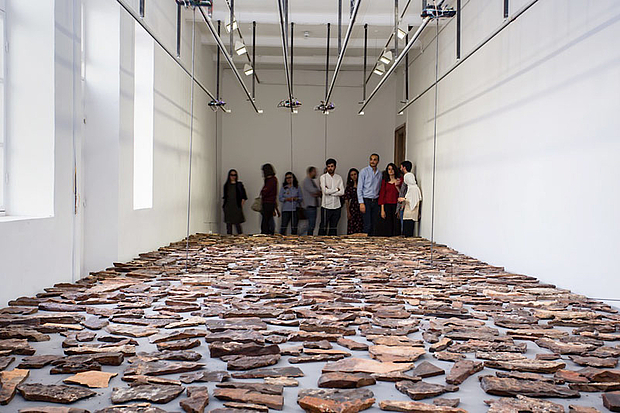 In this exhibition Khammash investigates the overlap of two of his specific interests: geology and music; two disciplines that appear far apart and are not commonly connected. Khammash sees them as jointly creating a new field of research that we could call "geo-acoustics" or "litho-acoustics", and that might open the doors to venture into new territories of music, sound, and compositions never experienced before. After years of direct field encounters with the geology of Jordan, the artist found a specific rock-layer that eroded and produced millions of surface flint stones, all with distinct ringing sounds. His initial testing of hundreds of these naturally shaped and thus "tuned" flints revealed that they easily adhere to the western musical scale of about two thirds of piano keys, and the upper four of the seven octaves of a piano. But the challenge presented by the desert flints is that they were found to produce a much wider colour palette of sound than the typical piano "chromatic scale" prevailing in the western world. They produce a range that is more reflective of a "microtonal" scale, and one which is made even richer with a unique feature of having "polyphonic" sound waves combinations – each with one or two fundamental tones, and with up to seven additional overtones. The Jordanian desert has millions of these flints pre-tuned by nature. 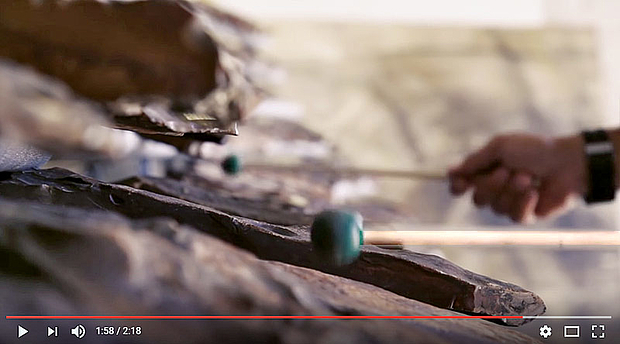 Each is a musical instrument on its own, with a combination of sound waves or notes acting as complex chords. Khammash thus poses the following questions: "Is there any repeated order? Some mathematical repetition that points to the 'note or scale of nature'? Is there perhaps a musical composition based on the more favoured and repetitive notes found naturally in the landscape?" To answer these questions, Khammash is re-thinking the known and prevailing musical scales, un-doing their fixed order to allow the hidden complex sound of the flint fit into new and never-before-identified musical scales, thus finding new mathematical computations for new sound compositions. Conclusions on the potential ability of the Jordanian desert flints to push the boundaries of known musical theory will take years of investigation. It will take keen and diligent observation to make sure not to miss some hidden order of sound composition, a natural mathematical order, dormant in millions of flints spread across vast areas of the desert. Amir Al Shinnawi: Help in exhibit assembly and installation. Anas Almikhi: Design and construction of robotic mechanism and display stands. Hashem Joucka: Investigating properties of sound in relationship to morphology and materials, preparing identical replicas of flint prices from other materials. Yousef Kawar: Experimentation in electronic effects, reverb and distortion. Randa Mujahed: Graphic design, layouts and text formats. Basel Naouri: Building six keyboards. Exploring alternative scales, and relevant mathematics that deviate from the known chromatic scale. Mohannad Rawashdeh: Robotics engineering and assembly, with programming and command design. Amjad Shahrour: Composing sound piece based on flints and help in flint arrangements at exhibition. We Inhabit the Accumulation of Time. Installation, Oct. 2018 - March 2019. 3rd exhibition to celebrate 30 years of Darat al Funun, Amman.